If you’ve decided on a destination wedding in Santa Barbara or Santa Ynez Valley, or you have out-of-town guests flying in for the wedding, why not give them the red-carpet treatment from the moment they touch down at Santa Barbara Airport or LAX? When it comes to service and dependability, you just can’t beat private airport transportation. When your guests arrive in Santa Barbara, things may seem a little daunting. From grabbing their luggage to making their way out of the airport to Santa Barbara or Santa Ynez Valley, it’s all just part of the process. But, you can make things easier by hiring private transportation, so they don’t have to worry about finding a shuttle service or taxi at a busy airport. The driver will pick them up at the airport and take them to your desired location. Unless you are familiar with getting to and from the airport, you may not know the fastest routes or alternate routes for that matter. An experienced chauffeur, however, is familiar with several different routes to ensure your guests arrive at their accommodation safely and on time. A flight can be long enough, depending on where your guests are flying in from. Hiring a driver ensures that they don’t have to waste any time once they land. It also saves you time. 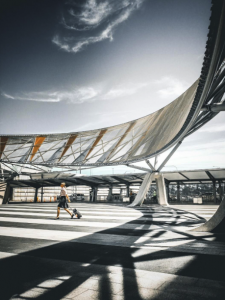 You don’t have to worry about getting to the airport in time to not keep guests waiting, and you don’t have to stress over navigating traffic and parking. A professional driver will be waiting for your guests when they land. What’s more, our chauffeurs can also take your guests back to the airport when they’re ready to fly home. Navigating unfamiliar streets or sharing a busy airport shuttle can be anxiety-inducing. By booking a private airport transfer service, you can ensure your guests receive the red-carpet experience in the form of comfort, less tension, and a friendly driver. Provide a superb experience for your wedding guests with on-time, reliable drivers who will pick them up and deliver them to their accommodation without any hassle and take them back to the airport when their trip is over. Silk Road Transportation provides the treatment your guests deserve and the quality service you expect. Don’t forget to book a ride back to the airport after the wedding and enjoy all the above benefits all over again! Book your airport transfer with Silk Road Transportation today.